Q1. Which architecture can you use to reduce the overhead on PE routers for VPN clients that want to exchange large amounts of routing information between their sites? Answer: The carrier’s carrier architecture. Q2. How does the carrier’s carrier architecture interface to the VPN client site? Answer: In exactly the same way as the basic MPLS VPN architecture with the addition of LDP on the PE-CE links. Q3. What types of routes are exchanged between the MPLS VPN provider and the VPN client when using the carrier’s carrier architecture? Answer: Internal routes that include the BGP next hops for any external routes the VPN client learns. Q4. What types of routes are exchanged directly between VPN sites when using the carrier’s carrier architecture? 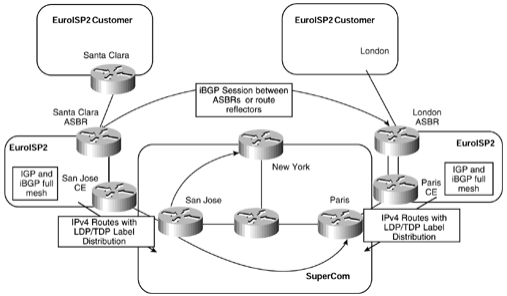 Answer: External routes are exchanged across internal BGP sessions established between C routers. Q5. When using the carrier’s carrier, can the VPN sites run only IP with no MPLS deployed locally? Answer: Yes, the architecture allows for VPN sites that run IP or MPLS. Q6. Describe the term hierarchical VPNs. Answer: Hierarchical VPNs use the carrier’s carrier architecture to provide VPN services between sites. This means that the BGP sessions between customer sites can exchange VPNv4 prefixes. Q7. What is the purpose of the interprovider VPN solution? Answer: To facilitate the connectivity of two or more sites of the same VPN across different service provider backbones. Q8. How is the exchange of VPNv4 prefix information between service providers achieved? Answer: Through the use of an external MP-BGP session or through the use of multihop MP-BGP. Q9. When advertising a route from one PE-ASBR to another PE-ASBR, why does the advertising router allocate a new label? Answer: Because no LDP label distribution occurs across the link, it is necessary to make sure that the VPN label for the route is not necessary to make sure that the VPN label for the route is not exposed to any intermediate routers that would cause a break in the LSP between ingress and egress PE routers.